Is Piketty's Capital a Threat to the Establishment? Anyone familiar with the underground or alternative media would have to ask themselves: Would Thomas Piketty be covered in The Economist, The Guardian, The Financial Times, The Washington Post, The Wall Street Journal and all other manner of establishment media if he represented something that genuinely threatened their interests? Maintaining a controlled opposition is something that any entrenched power structure is going to pursue. Piketty’s Capital in the Twenty First Century is portrayed by the establishment media as a shocking affront, an “attack on Western Capitalist Democracy,” “a return of Communism,” and all other manner of purple-faced blow-hardy rhetorical fuss while maintaining the existing social order, and never laying a glove on Wall Street. With the on-going collapse of the American middle class, controlled opposition figures are even more important as people will be looking outside of the traditional, established, and clearly failing models that brought us to the present crisis. But Piketty is no threat to this establishment. Globalization has been the newer buzzword for what could once be seen as a form of economic Imperialism. The British Empire, from the 18th through the 20th centuries, fought multiple wars to open foreign markets to its free trade system. Everywhere free trade prevailed -from the British colonies in India to the American South’s plantation slave system- the trend toward the enslavement of the laborer commenced. Globalization, in the modern context, is again expressed through giant job-destroying trade deals like NAFTA, CAFTA, as well as the more recently proposed Trans-Pacific Partnership (TPP) and the Transatlantic Trade and Investment Partnership (TTIP). These massive free-trade deals conduct an international ‘race to the bottom’ in which foreign wage slaves are made to “compete” with American industry and workers who had once enjoyed a decent living standard. A standard of living achieved through centuries of blood and toil fighting for working-class rights against the ‘liberty’ of the predator class of financial parasites. Capital in the Twenty-First Century is a compromise within this globalized system; a system in which the main beneficiaries are Wall Street and Western central banks. Thomas Piketty, the esteemed and respected economist, sees no need to challenge this system of free trade and globalization, of which one of the most egregious administrators is the International Monetary Fund (IMF). The terms ‘Path-breaking, ‘adjusting wages,’and ‘uncompetitive’ are all code for austerity. Similarly, Thomsen’s detached phrase ‘…lack of adequate price adjustment reflects primarily structural rigidities in product and labor markets’ means that Greece still has some damnable labor laws that prevent the floor from dropping out again, thereby crushing labor even further through austerity. This style of rhetoric is used by the IMF to loot billions out of not only the Greek economy, but the global economy. From IMF shock therapy in Russia and Latin American to the “structural adjustments” in south East Asia in the late 90′s, the effect is the same: drive down wages, remove currency controls, and privatize state infrastructure and assets. If you don’t think that the 1% doesn’t benefit greatly from keeping wages low, you aren’t paying any attention to anything that’s actually happening. Thomas Piketty is, in many ways, a creature of John Maynard Keynes, a British intellectual and economist whose 1936 work, The General Theory, was a response to the declining dominance of the British Empire. Keynes’ economic theory was, in many ways, a dying empire’s attempt to reassert its grip on the core foundation of academic economics. 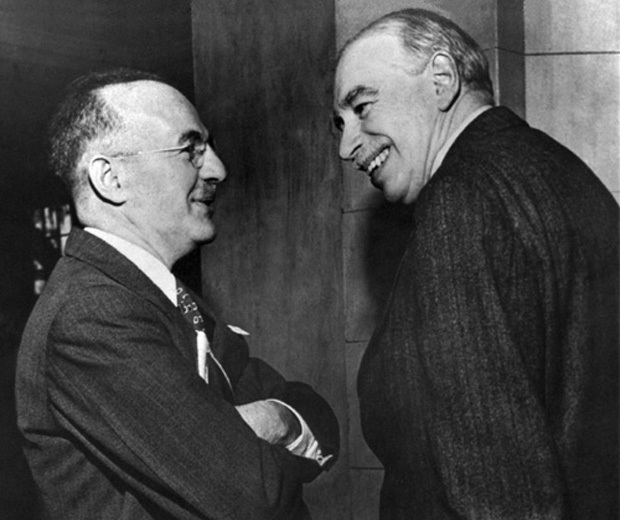 Lord John Maynard Keynes (right). Director of the Bank of England, 1941-46. In an era in which much of Europe had devolved into fascism, the USA and the USSR pursued different economic planning methods to increase productivity and improve labor through New Deal and Soviet industrialization projects. Meanwhile, the British Empire chose to reassert and re-consolidate its hegemony in the area of economics. The General Theory, in short, sought to rob a nation of it’s ability to use its central bank for the purpose of fostering an economic recovery. By admitting that the so-called ‘business cycle’ was not necessarily self-correcting and that the State could take action against the business cycle, but only within the narrow, limited constraints of the federal budget (preferably not toward productive enterprise) Keynes was deliberately ignoring the ability of a nation to produce its own public credit. Britain’s foremost economist Keynes thought that, in effect, digging holes and filling them up again was “better than nothing” in terms of an economic recovery program. As a result of this flawed thinking, the British economy languished throughout the interwar period between WWI and WWII. 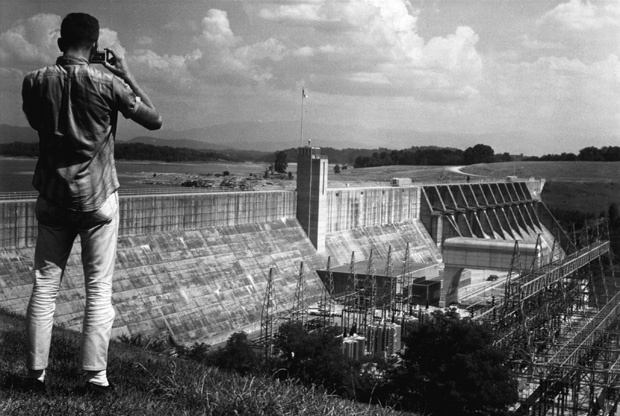 While the British theorized about digging holes, the US New Deal and Soviet industrialization programs did not follow this model, but precisely the opposite: public credit employed for great projects and intentionally fostering the increase in productive capacity (in the US case) or the direct seizing, build-up and management of the principle elements of a heavy industrial sector in the Soviet case. This is ultimately why they were successful in reducing poverty and increasing the standards of living in both countries. When industry sits idle, when fields lay fallow, and when a large portion of the population is out of work (through no fault of their own), it is only rational to reunify these idle components of a national economy toward building the public good or, as it is enshrined twice in the US Constitution, The General Welfare. Like Keynes, Piketty writes about the failure of the present economic system while simultaneously failing to provide solutions that directly challenge the power of finance oligarchs and the system that has been corrupted to suit them. Piketty’s “solution” to global inequality is his much hailed Global Wealth Tax: a difficult to implement, utopian ploy. The global wealth tax is a timid plea for a portion of what oligarchs and financiers have siphoned off the population via usury, suppression of labor, wage theft, attacks on unions, hyper-trading, Libor cartel interest rate rigging, privatization, and a myriad of scams and extraction techniques. Thomas Piketty follows Keynes in regard to Central Bank orthodoxy: that central banks can and only should lend to other banks, not to the government, industry, or the people at large. Piketty, again like Keynes, can be said to defend Wall Street, the City of London, and other assorted banking cartels via the sin of omission. The “wealth” of Piketty’s Global Wealth Tax amounts to mostly financial assets based largely on financial derivatives. But this is merely paper wealth. Only with the reassertion of ownership of the nation’s central bank, put to use for the nation’s General Welfare, can real wealth be created. Piketty’s tax is a fight for the Golden Goose egg laid by those that have captured this power for themselves. Better to fight for the Goose. Better to fight for the Central Bank. The modern banking system manufactures money out of nothing. The process is perhaps the most astounding piece of sleight of hand that was ever invented. Banking was conceived in inequity and born in sin…Bankers own the earth. Take it away from them but leave them the power to create money, and, with a flick of a pen, they will create enough money to buy it back again…Take this great power away from them and all great fortunes like mine will disappear, for then this would be a better and happier world to live in…But, if you want to continue to be the slaves of bankers and pay the cost of your own slavery, then let bankers continue to create money and control credit. Tackling global inequality (itself a mere symptom) from the perspective of a global tax on wealth rather than seizing that mechanism by which the theft was conducted in the first place is absurd. Piketty, like Keynes, tries to derail the only thing that can solve the crisis. Both books The General Theory and Capital in the Twenty First Century try to move around factors within the existing rotten system, rather than directly attack the principle source of the inequity: private, cartel ownership of a nation’s authority to create credit, i.e., its central bank. Piketty ignores, not only the potential power of central banks, but the wholly unfit ruling class who currently controls them. If you wanted to foster a political recovery would you loan to productive enterprises, infrastructure programs, housing, utilities, industrial companies? Or would you lend to a casino? Presently, the Central Banks of the declining West are, in effect, choosing the latter by solely investing in Wall Street banks (or their international equivalents) to prop up a bankrupt mass of derivative contracts which constitute little more than gambling, illegal forms of insurance, and other speculative instruments which provide zero or negative value to the real economy at large. Piketty finds it prudent to “limit” the balance sheets of central banks for precisely the reason of starving production. He argues that the Federal Reserve operates under “strict mandates” when, in fact, its lawlessness and criminality are nearly unchecked. In 2011, an internal Federal Reserve audit conducted by the Government Accountability Office, confirms that tens of trillions of dollars of “loans” at zero percent interest went to the largest global financial institutions; from the US-based Citigroup to the German Deutsche Bank. These Federal Reserve “loans” are, in fact, credit created out of nothing (printed, if you like). They are then handed at very low interest to institutions that has no ability to pay it back (i.e. 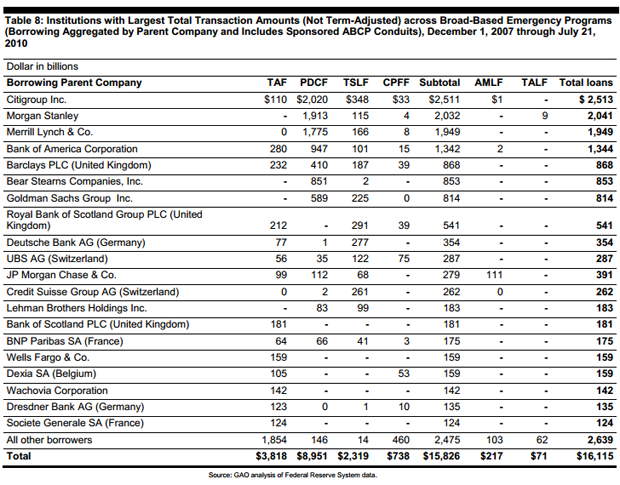 Wall Street banks). This rampant speculation, coupled with a stagnation of physical production, is the primary cause of the inflation that the US has experienced over the duration of our current depression. Industrial production and high-tech sectors, by contrast, can pay back their investments. Productive activity is tied to the general welfare via physical products; therefore production has a use value. However, excessive speculation has zero use value other than its own self-serving purpose of maintaining a fictitious asset bubble. In other words, excessive speculation amounts to only an increase in dollar bills (inflation), as opposed to an increase in useful products such as food, clothing, housing, steel, etc. Wall Street uses its “capital” to shore up derivatives losses and burden the US population with high-interest loans. These loans, in turn, freeze social mobility and only serve to widen the very inequality which Piketty claims to be an enemy. If the Federal Reserve loaned to productive enterprises we would have an economic recovery in short order. The problem of resolving our current world economic depression, if left to bankers acting in their own self-interest, will never come. If the people, however, knew what to ask for we could begin a robust economic recovery tomorrow. We do not want a mere portion of the loot that this class of oligarchs and financial extractors have purloined from the population. We want to liquidate them as a class by stripping them of their undo privilege and power. Their incompetence and malfeasance is no longer a social nuisance, it is an existential threat to our country and the world. Nationalizing the Federal Reserve (or respective central banks), a 1% Wall Street Sales Tax on speculation, a protective tariff on wage-slave imports, and a return of Glass Steagall would accomplish this. These actions would deliver the first and vital steps on a path of creating a new New Deal. The nation’s ability to create its own credit is always available. We need only the political will to liberate this sovereign power from Wall Street and redirect it toward promoting the General Welfare.